When the process began of editing the radio show of Vonda Pelto talking with Sancho Jones, host of Thunderstruck Radio, the editors at E.B. GO Vision Media were surprised to hear questions and inquiries never explored by radio, TV or press reporters. The lengthy interview format, cf course, gives the host more latitude than say a morning drive time show that has maybe one short segment, nonetheless his inventiveness makes for terrific podcasts and will be make great Radio Show Videos for use in Internet PR. 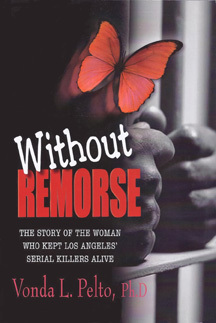 Book Review by Chuck N. Baker, Editor/Publisher of Las Vegas Veteran’s Reporter, of Without Remorse: The Story of the Woman Who Kept Los Angeles’ Serial Killers Alive. “The title of this book is cute, catchy, and perhaps a bit deceiving. Pelto kept the killers alive, alright, but it’s because she worked at the Los Angeles County Men’s Central Jail, where the freeway killers, trash bag murderers and hillside stranglers were kept. Pelto was hired to help keep those killers alive. She came to know the killers and befriended them. Some were charmers, some were talkers, and none had guilt or remorse, she writes. She has many stories.